For the past six weeks, Greenhill Elementary students and their parents have been meeting on Tuesday nights to practice family literacy. Family Reading Bonds, a program sponsored by the Mississippi Humanities Council, provides organizations with 21 different books for children and their families to read together. Each week the group would meet, along with a storyteller, Dr. Rebecca Jernigan, and a discussion leader, Dr. Elaine Gelbard, to review the stories they had been learning about at home. 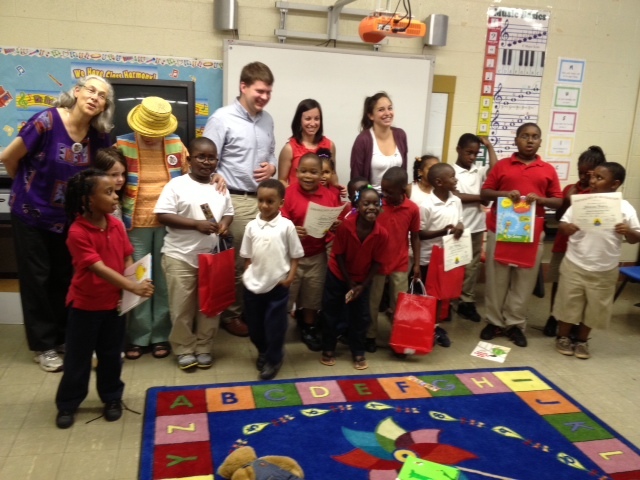 VISTAs Ryan Parsons, Brittany Galloway, and Erin Mauffray with the students and storytellers at Greenhill.